2018 was the biggest year yet for QuantumListing. Our user base has boomed and we’ve added features galore. 1. Syndications: The word of 2018 for CRE tech was “syndication.” When we say syndication, we mean partnerships between CRE tech platforms in which users share their information across the platforms to connect them and streamline their digital CRE experience. Check out our article about the power of syndication and our partnerships with Buildout, SharpLaunch, and LDCRE. 2. Networks & Groups: Two of the most important features we added to your profile in 2018 were Networks and Groups. With Networks, QuantumListing connects you with brokers in your region or interest area. You can also make networks of your own. Groups are great for connecting with people in your niche, be it “industrial land brokers of Buffalo, NY” or “Wyoming brokers who love skiing,” you can make a group for whatever you want. You can see all the listings in your Group and chat with Group members to network and establish deals. 3. QuantumListing iOS App 2.0: Once upon a time, when QuantumListing began in 2014, it was exclusively an iPhone app. Over time the platform shifted to a more desktop focus and the iPhone app was discontinued. This July, QuantumListing rereleased its iOS App Store app, so now our iPhone users have access to QuantumListing’s features right on the app. We did a minor refresh of the app in December, so be sure to check if you have the latest version. For our Android users, there is a QuantumListing app that can be found in the Google Play Store. 4. An Explosion of Users and Listings: 2018 was the year that many discovered QuantumListing. Our number of users doubled this year, and the number of listings leaped up by a factor of more than five. This was no doubt due to the many new features that we’ve added and the syndication partnerships that make it easier than ever to add listings. We hope to improve on that performance even more in 2019! 5. A Brand-New Sidebar for All Our Users: As the number of QuantumListing features grew, the side bar on your personal profile page kept growing too, so it became long and a little unwieldy. That’s why we built the new sidebar. Now the sidebar is compartmentalized in sections, like “Listings.” In the Listings section of the sidebar you can check out all your active listings, archived listings, and saved listings. Go to your profile page to explore all the features you can access from your sidebar! 6. Chat with All Our Users: Now you can chat with any QuantumListing user right on the platform. Of course, you can still connect with everyone via email. But it can be quicker and more convenient to link up right on QuantumListing. To chat, you just need to go to another user’s profile page and click on the little speech box next to their profile photo. You can also chat with the users in your Networks and Groups. Connecting with other QuantumListing users has never been easier. 7. Added the Schedule a Demo Button: Joining a new technological platform can be like entering into a new relationship—it’s a big commitment. And, commitment can be a little scary, especially when you don’t know exactly what you’re signing up for. That’s why we added the “Schedule a Demo” button for all non-members. Non-members can sign up for a demo in which they’ll be walked through all of QuantumListing’s features. Existing users can also schedule demos to learn more about certain QuantumListing features. Some example demos for our existing users are “15 Minute Profile Tune Up” and the “60 Minute Master Class. 8. #LetsGetSmart18 Speaker Series: For the third year running, QuantumListing has hosted the #LetsGetSmart speaker series at RECon in Las Vegas. During the series, some of the leading innovators in retail, real estate, and tech spoke about topics such as mCart, a blockchain-based retail platform, Walc, a GPS app built specifically for pedestrians, and Digsy.ai, a commercial real estate CRM that’s supercharged with AI. To learn about these disruptive ideas and more, check out the above link which has a list of all the presentations from #LetsGetSmart18. 9. QuantumLister Profiles: Over the past few months, we’ve been running an interview series with some of our most active users, the Quantum Listers. We asked them about how they get their deals, their opinions about the CRE industry, and what they love about QuantumListing. 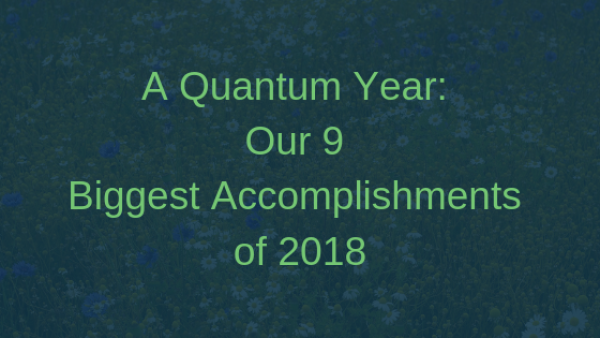 2018 was our biggest, most exciting year yet at QuantumListing. Now we’re excited to see where 2019 will take us next!